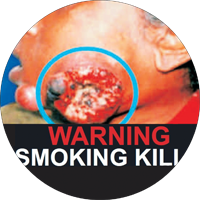 Government buckles under pressure from tobacco industry and halts order on large pictorial warnings on tobacco products. Will profit prevail over public health? Tobacco control measures in the country have been impeded by industry pressure. On October 15 last year, the Union Ministry of Health and Family Welfare notified the Tobacco Products (Packaging and Labelling) Rules under the national anti-tobacco law to increase the size of pictorial warnings on the package of all tobacco products from the current 40 per cent to 85 per cent—60 per cent of which should be pictures and 25 per cent text. The notified rules were to be effective from April 1 this year. But the government has put its decision on hold after criticism from the tobacco industry. Dilip Gandhi, chairperson of the Parliamentary Committee on Subordinate Legislation of the current Lok Sabha, wrote a letter to Union health minister J P Nadda on March 2 saying that his committee was examining the notified anti-tobacco rules and suggested deferment of their implementation till it arrives at an appropriate conclusion. The committee, in its report presented in Parliament on March 18, mentions that a few members of Parliament (MPs) and industry organisations had expressed “serious apprehensions” about the adverse impact of the modified rules on the livelihood of tobacco workers. The committee also questions the health ministry’s authority to frame tobacco rules, saying that the ministry should seek views from other departments, such as labour and agriculture, since the socio-economic impact of these rules trespasses its domain. Following the report, the health ministry has decided to postpone the implementation of larger pictorial warnings, although no formal announcement has been made yet. Health activists and experts have strongly opposed the move. On March 31, several MPs, civil rights activists, doctors and patients met at the Constitution Club in Delhi to express their disapproval of the government’s decision. In the meeting, Supriya Sule, Lok Sabha MP from Pune belonging to the Nationalist Congress Party, sought the prime minister’s intervention. “It is disheartening to see that the government has decided to delay its earlier decision. India demonstrated global leadership last year when it announced the new rules mandating larger pictorial health warnings on tobacco products. Taking cue from us, countries like Nepal, Pakistan and Sri Lanka also announced to increase the size of health warnings on tobacco products to 90 per cent, 85 per cent and 80 per cent respectively,” she said. Activists believe that the committee headed by Gandhi has no mandate over the anti-tobacco law—Cigarettes and other Tobacco Products (Prohibition of Advertisement and Regulation of Trade and Commerce, Production, Supply and Distribution) Act—passed by Parliament in 2003. “The law allows the health ministry to frame rules in pursuance of tobacco control in the country,” says Monika Arora, an anti-tobacco activist. P C Gupta from Healis Sekhsaria Institute for Public Health says that the committee is an advisory body and the health ministry could have rejected its recommendations. “It is clear lobbying by the tobacco industry. We have to see whether we want to safeguard industry’s interests or 1 million people who die from tobacco-related diseases every year,” Arora adds. The World Health Organization (WHO) has warned that tobacco companies are undermining anti-tobacco efforts made by governments. At the World Conference on Tobacco or Health, 2015, held in Abu Dhabi on March 18, WHO director general Margaret Chan said she would like to see all tobacco companies shut down. “Governments that are trying to protect their citizens through larger pictorial warnings or by introducing plain packaging of tobacco products are being intimidated through lengthy and costly litigation,” she added. Australia’s legislation on tobacco that mandates plain packaging is being challenged at the World Trade Organization by Philip Morris Asia, a multinational tobacco company whose products are sold in more than 180 countries. A 2012 report of the health ministry links rampant chewing of tobacco to almost 90 per cent of oral cancer cases in the country. Every year, 75,000-80,000 new cases of oral cancer are reported. Public health experts say clear pictorial warnings about the harmful effects of tobacco are important in India, where education and awareness levels are low. Research by several tobacco control groups shows that regular tobacco users are inhibited by large warnings, while adolescents and children are prevented from initiation. Smaller warnings have not been found to be very effective. But the parliamentary committee thinks differently. 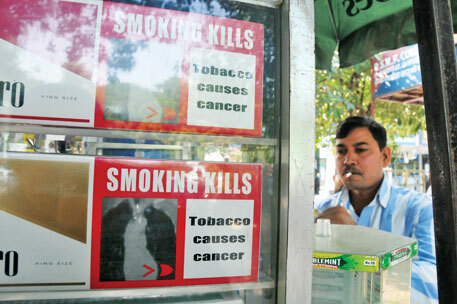 Newspaper reports have quoted Gandhi saying there is no Indian study linking tobacco with cancer. “Since cancer does not occur only because of tobacco, the Indian context should be studied in detail. Many people depend on bidi-making in states like Madhya Pradesh, Andhra Pradesh, Maharashtra and Chhattisgarh,” he had said. Health experts have snubbed his remarks, calling them ridiculous. Even as the industry projects that it is working for the the cause of tobacco workers, it continues to exploit them. “Bidi rollers live in abject poverty. Moreover, the trade is practised in homes where children and pregnant women inhale tobacco dust. Many of them develop tuberculosis,” says Pankaj Chaturvedi, a doctor at the Tata Memorial Hospital. The debate over large pictorial warning on tobacco products has now reached the highest authority of the country. According to media reports, Prime Minister Narendra Modi has also supported the health ministry’s decision to increase the size of pictorial warnings. However, Down To Earth could not verify these reports.